How do you relax your stressed muscles and invigorate energy to dull skin cells. Well whatever could you be your mode of relaxation, there is one thing that needs to be incorporated in all the above routines, and that is- Essential Oils. 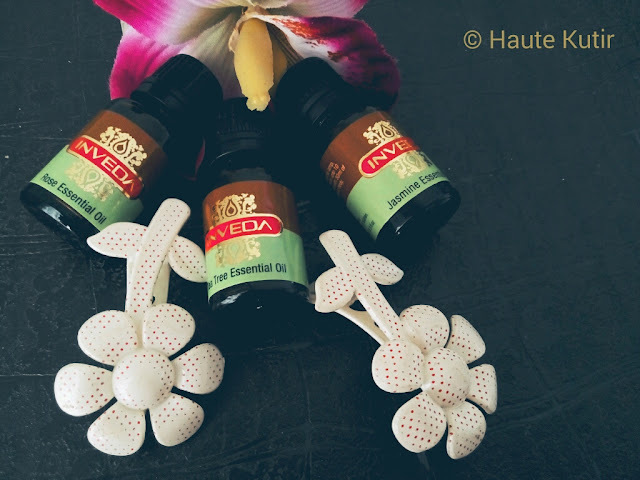 Yes, essential oils are the new lifestyle products that is a #MustHave for all your Yoga and spa routines. These oils not just fragrant the ambiance but also help in relieving your stress and adding to your skin. Their usage has greater healing properties. 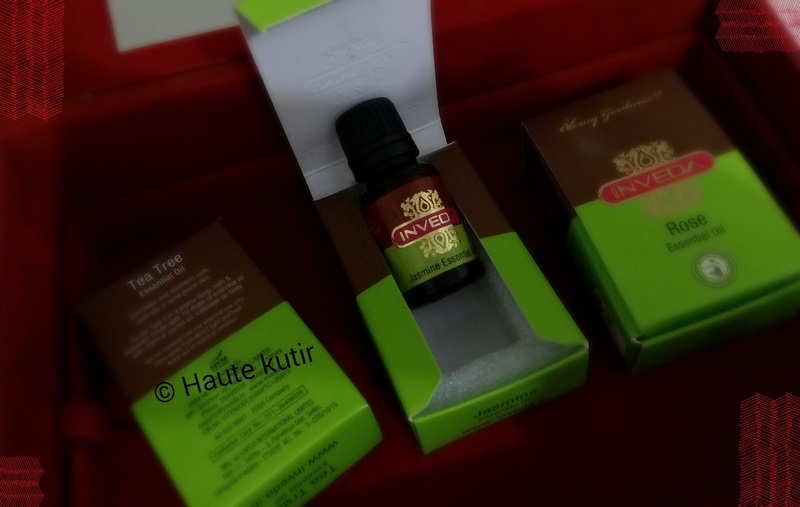 To tap this unique market, Ayurvedic Beauty brand Inveda has launched a range of essential oils for multipurpose usages like Body massage, potpourris and aroma diffuser lamps. Inveda told me that these oils are made from most powerful rejuvenating natural fruits and flowers. Their fragrance and usage are claimed to nourish skin and freshen up your soul. Hmmm interesting indeed, given the stressful, busy city lives that we have. It comes in 10 ml bottle and in range of Orange, Bergamot, Geranium, Ylang-Ylang, Jasmine, Rose, Eucalyptus, Patchouli and Tea Tree Oil. I have used their Lychee shake Cleansing Milk and loved it. So when I heard about the launch of their new essential oils, I went ahead and tried three different oils from their range- Rose, Tea Tree and Jasmine. Each had their own distinctive benefiting properties and fragrance. 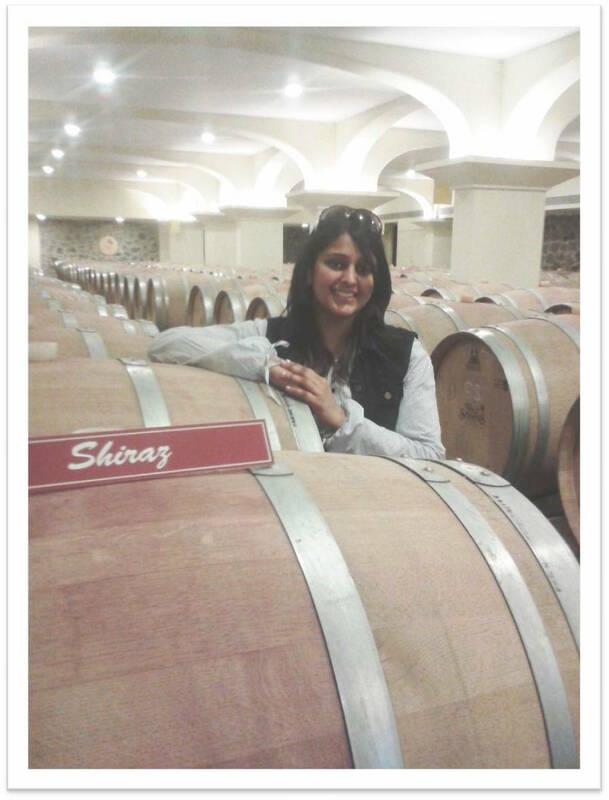 Haute Kutir experience: We loved the oil[s] and used it purely for body massage and Oil lamp diffusion purposes. The Rose Oil smells like Original Roses and left a good feeling when mixed with a carrier oil and applied to body. The Tea Tree Oil and Jasmine too smells just right, devoid of any sign of artificial flavors mixed. We also loved the small, tubular mouthed bottle that helps in retaining the unique fragrances while making it easy to pour in. They are quite handy and suitable for travel. I have mixed the Rose oil [2 drops] in bathing water and it made for quite a soothing bath. Negatives: We haven't found yet as far/ as much we used yet. The pricing is competitive and varies from oil to oil. However, we found it quite worth the price given that it promises premium quantity. 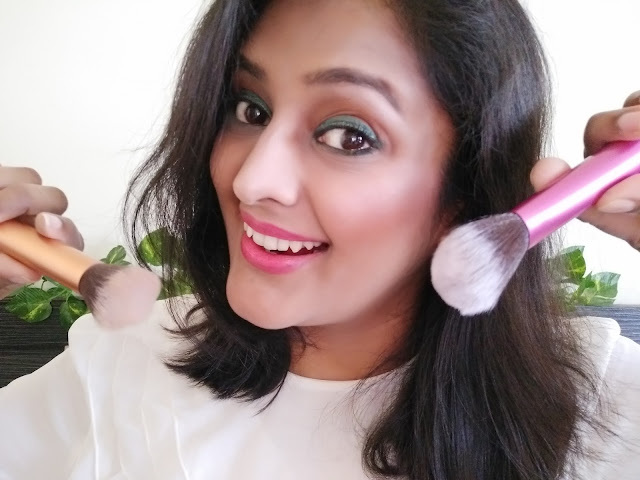 Overall, Yes we liked the products and would use them again. And recommend to others. 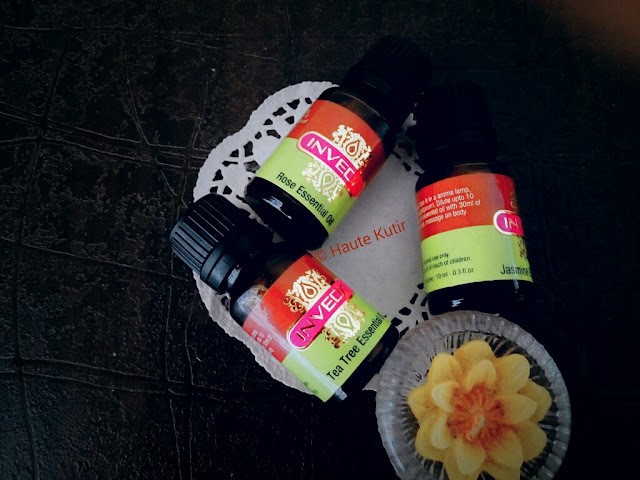 Haute Kutir Tips: You can pour two drops of Rose Oil in a bucket of your Bathing water or your tub and soak in for a relaxing and refreshing bath that leaves you smelling good and invigorated. 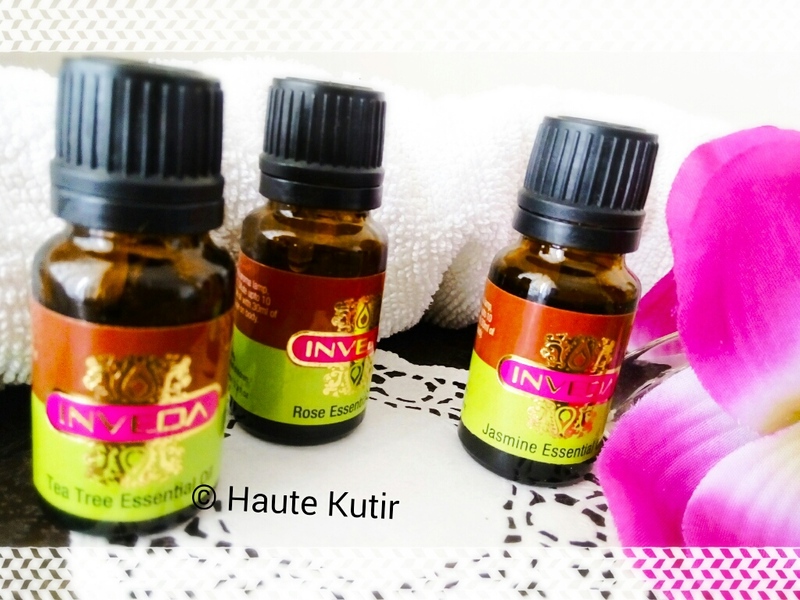 Inveda is an amalgamation of two words “Infusion” and “Ayurveda'. It is a sister concern company of Vedic line which has launched recently by HVM group. Ayurveda defines beauty as transforming all aspects of body and mind to the most auspicious level called “subhangakaranam”. The foundation of Inveda being infusing natural ingredients with the beauty secrets of Vedas, a unique range of “healthy beauty” products has been developed. Inveda infuses the age old wisdom from the Vedas with the therapeutic and regenerative qualities intrinsic innatural extracts.